What’s going on in your neighbourhood? Reported crimes in Windsor are now listed online on a site called CrimeReports.com. The Windsor Police Services have entered the Web 2.0 world by submitting their crime data to CrimeReports. A quick glance at the site reveals 700+ reported incidents within the last fourteen days. Everything from burglaries, robberies and sexual assaults to auto theft is listed on the site, with updates coming in daily. The Windsor Police Services Board approved using the CrimeReports.com system back in May. Using the site’s tools, citizens can access crime information and police can monitor crime patterns using the mapping interface and data extraction tools. 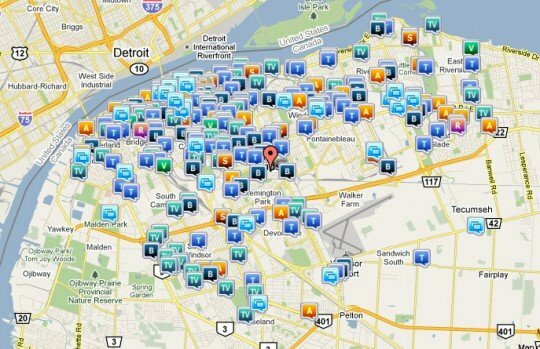 Windsor’s inclusion on CrimeReports.com marks a big step for public access to governmental data and comes a little over a year after police switched their radio systems over to an “encryption” method. Previously, citizens with police scanners could catch the latest crime news. The new radio system shuts out all attempts to listen to the police, but CrimeReports bridges this gap by providing crime info with a bit of a daily.